Everyone loves ordering spinach artichoke dip as an appetizer, amirite? Well here’s a soup version that’s every bit as flavorful, probably nearly as fattening and downright delicious. I checked out from the library “The Keto Reset Instant Pot Cookbook” for funsies and it’s packed with super tasty recipes. I tweaked this one a little to boost the flavor by adding onions and deglazing with white wine. I’ve never used the sauté function on my Instant Pot, out of fear mostly, but I tried it out and it works great! You could definitely make this recipe on the stove top, but it was pretty darn quick in the pressure cooker. This creamy soup is packed with flavor, and hey – spinach is good for you so let’s call this a little bit healthy too. Melt butter in a sauté pan (or use the sauté function on your Instant Pot). Add the onions and mushrooms and sprinkle lightly with salt. Cook until all the liquid has come out of the mushrooms, about 10 minutes. Pour in the white wine and let it bubble away a little for a couple of minutes. Add the cream cheese and stir until melted. Add contents to the Instant Pot if you haven’t already. Add the artichokes, mustard, sage, thyme, granulated garlic, salt and pepper and stir till everything is well coated. Pour in the broth and water. Place cover on the Instant Pot. Make sure the release valve is set on “sealing” and pressure cook on any food setting (I used poultry) for 7 minutes. Let the Instant Pot sit for 5 minutes, then carefully release the steam release valve. Stir in the thawed and drained spinach and let the soup warm it for a couple of minutes. Stir in the cream. Use an immersion blender to blend the soup slightly, if you’d like. This made it more appetizing because I didn’t have odd chunks of mushroom and spinach in every bite. Serve in bowls topped with freshly grated Parmesan or Pecorino Romano cheese. Every once in a while I have the wherewithal to make lasagna with homemade noodles. This evening I decided to try something different. Instead of traditional red sauce and ricotta I made a creamy béchamel sauce and layered the spinach noodles with shredded chicken and marinated artichoke hearts. The marinade from the artichokes added a tangy flavor to the dish and the creamy sauce was pure deliciousness. You can of course use store-bought noodles, but there’s something fancy about fresh pasta. It’s been a helluva good mushroom season so far. This week I found three primo porcini in my yard. I wanted to try something different from my typical porcini and pasta recipes. Quiche sounded about right. I’m not familiar with making quiches. I know it’s a crust, some egg, cream, cheese and filling, but beyond that I have to follow a recipe. When I asked my coworker, Allison, today if she has ever made quiche she gave me a resounding “yes.” She had a few quiche tricks up her sleeve and was happy to share them. Instead of following a recipe, I winged it using Allison’s advice. What came out of the oven was smoky, mushroomy, fluffy and not overly eggy. My husband travels for work so I’m frequently “solo parenting.” Working full time, picking up our son and getting dinner on the table by 6 or 6:30 can be a struggle. Tonight was really tricky since we got home late, but thanks to my rare meal planning this week I was able to put together a wholesome pasta dish in under 30 minutes. By marinating the frozen chicken in the fridge overnight I didn’t have to make a mad dash to thaw it out and flavor it right before preparing the dish. I felt like a winner, winner, chicken dinner! The night before, place the frozen chicken in a large Ziploc bag with all the marinade ingredients. Let sit overnight in the fridge. It’ll be delicious by tomorrow. Place a large pot of salted water on the stove to boil. Cook the noodles according to packaging. Meanwhile, heat a skillet with a tablespoon of oil over high heat. When the pan is hot, cook the chicken tenders till browned, about 4 minutes on each side. Set aside. When cooled, chop into bite-sized pieces. Clean out the pan with a paper towel and add the rest of the oil and the butter. Add the spinach and tomatoes and cook spinach till it’s wilted. Add the garlic and cook for another 30 seconds or so. When pasta is drained, add it to the pan with the chicken, Parmesan and cream. Add salt and pepper to taste. Serve immediately. This weekend I had the opportunity to attend End of Summer Camp, which proved to be a unique bonding experience for Anchorage grown-ups. I met bloggers, event planners, printmakers, food critics, photographers, storytellers and other local professionals all while enjoying nostalgic campy activities. The campers were fed by Fork Catering, and I took every available moment to enjoy their meals and chat with chefs Rob and Dave. Chef Rob Kinneen taught a cooking workshop, which I eagerly signed up for. Turns out he was going to demonstrate homemade pasta-making. I’m familiar with making my own pasta, such as comb pastas, basil fettuccine and Russian pelmeni, but I was interested in learning techniques from a professional chef. 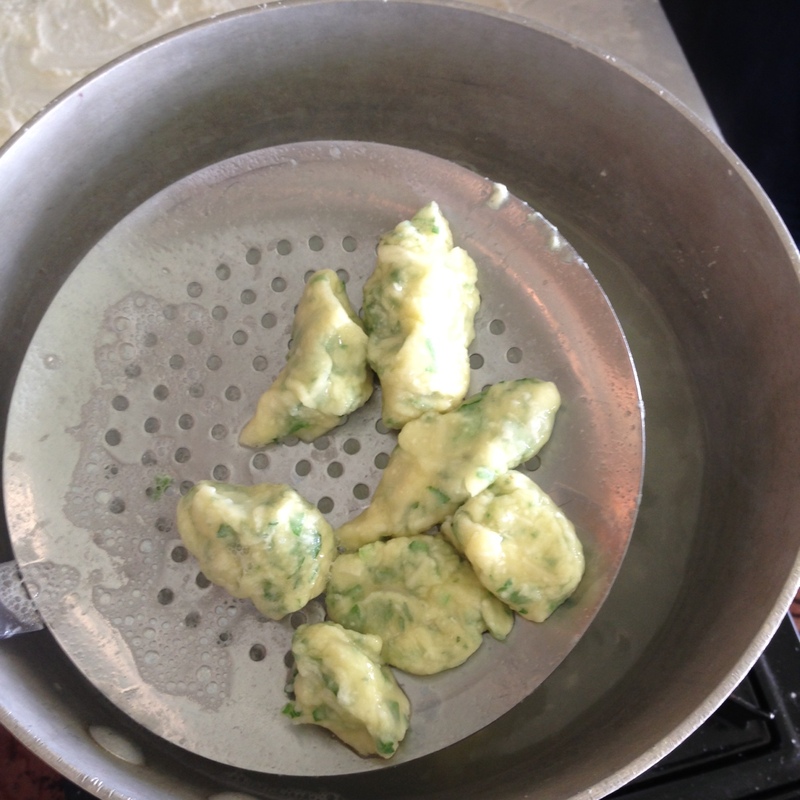 He led a hands-on lesson on tortelloni and ravioli nudi. The tortelloni, which were essentially large tortellini, were familiar to me, but the ravioli nudi were entirely new. The nudi are like ravioli without the noodle, literally naked ravioli. Instead you incorporate cheeses, flour, herbs and egg into a sticky, soft dough and create small dumplings, which are then boiled. 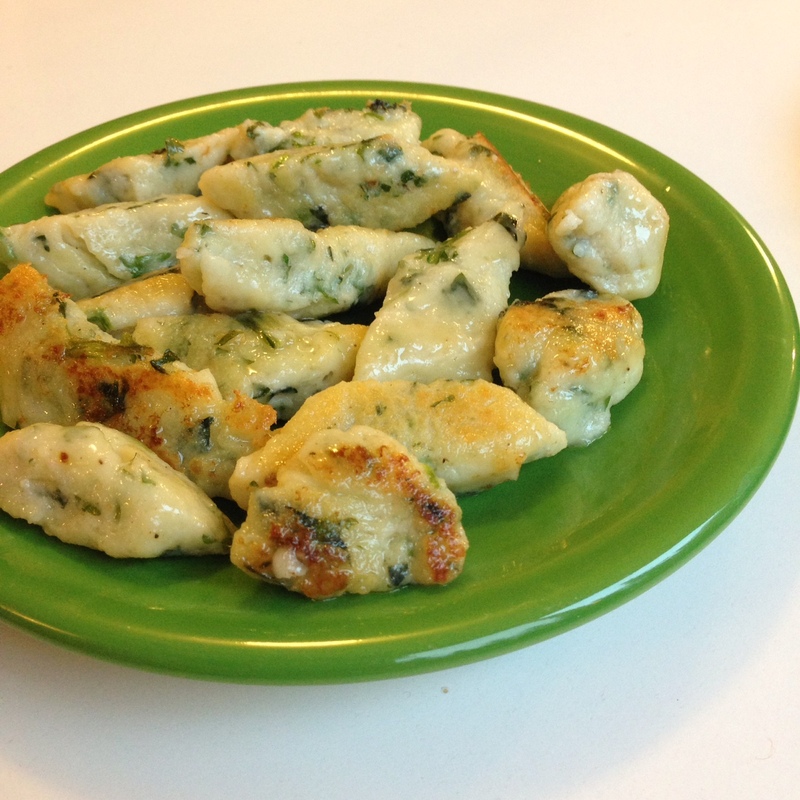 They are sort of like gnocchi, but with cheese instead of potato. 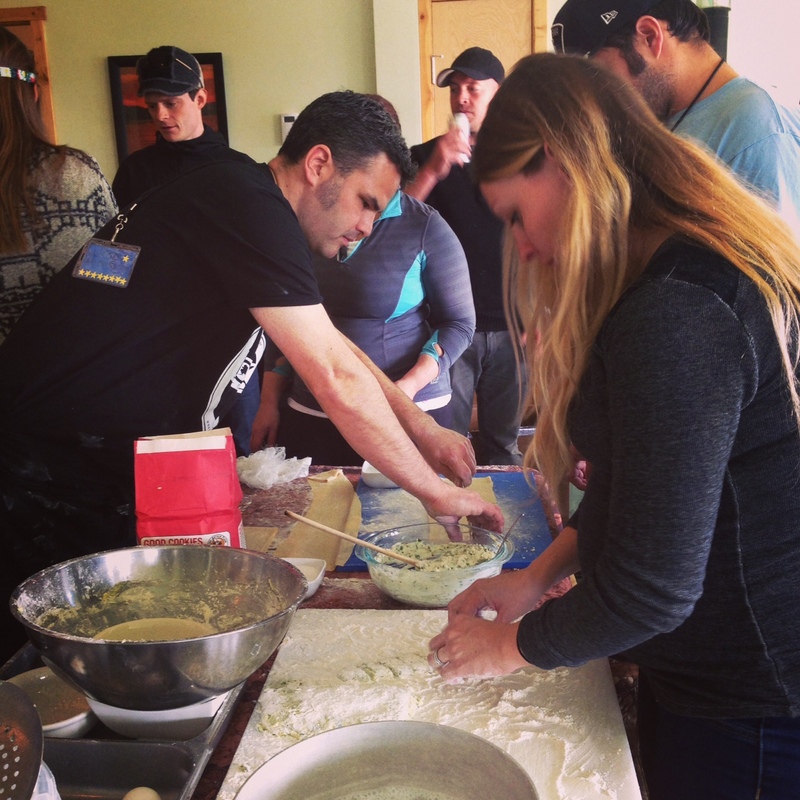 Chef Rob Kinneen instructs campers on how to roll out ravioli nudi dough. My only attempt at making gnocchi in the past was a complete slimy failure and Rob’s technique for making nudi could be easily translated to gnocchi. I had to try the recipe myself when I got home. Bring a large pot of salted water to a boil. Fill a large bowl with ice and cold water and set beside the pot. Meanwhile beat together the eggs, yolks, garlic, chili flakes, nutmeg, salt and pepper in a medium bowl. Incorporate the ricotta till smooth. Add the parmesan, parsley and spinach. Slowly add the 1/4 cup flour till a super sticky dough forms. It should be the consistency of thick, lumpy pancake batter. Heavily flour a large cutting board. Gently turn the dough onto the board and work in enough extra flour for it to be very soft and sticky inside, but coated on all sides in flour. Form the dough into a 1.5-inch tall rectangle. Cut the dough into 1.5-inch strips and gently roll each strip around, dusting with flour, till coated evenly on all sides. 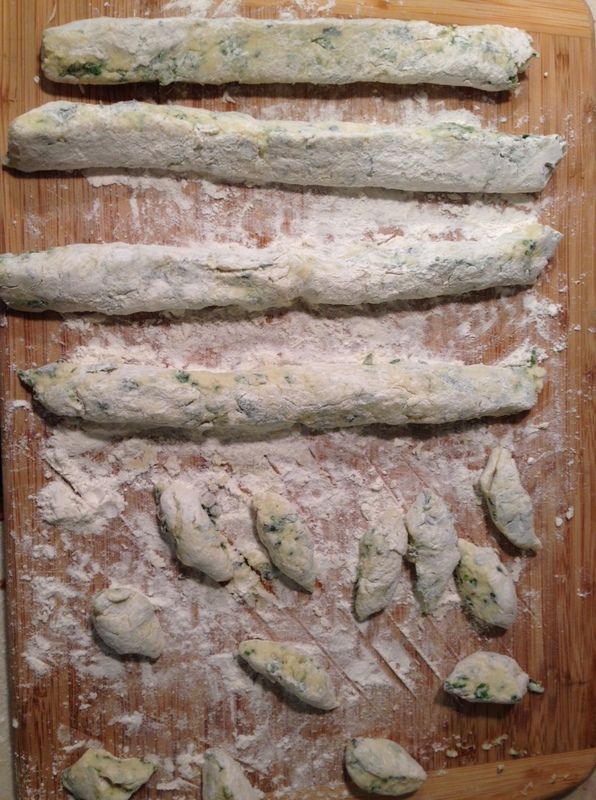 Cut each strip on a diagonal into 1-inch pieces so you have small, oblong dumplings. Gently roll each dumpling around in your floured hand till they are each coated and no sticky dough is exposed. When the water is at a rolling boil, gently add the ravioli in batches so the water doesn’t cool down too much. Boil for just a few minutes, until the ravioli float to the surface. With a slotted spoon, strain out the ravioli and add to the ice water bath. Repeat with remaining ravioli. 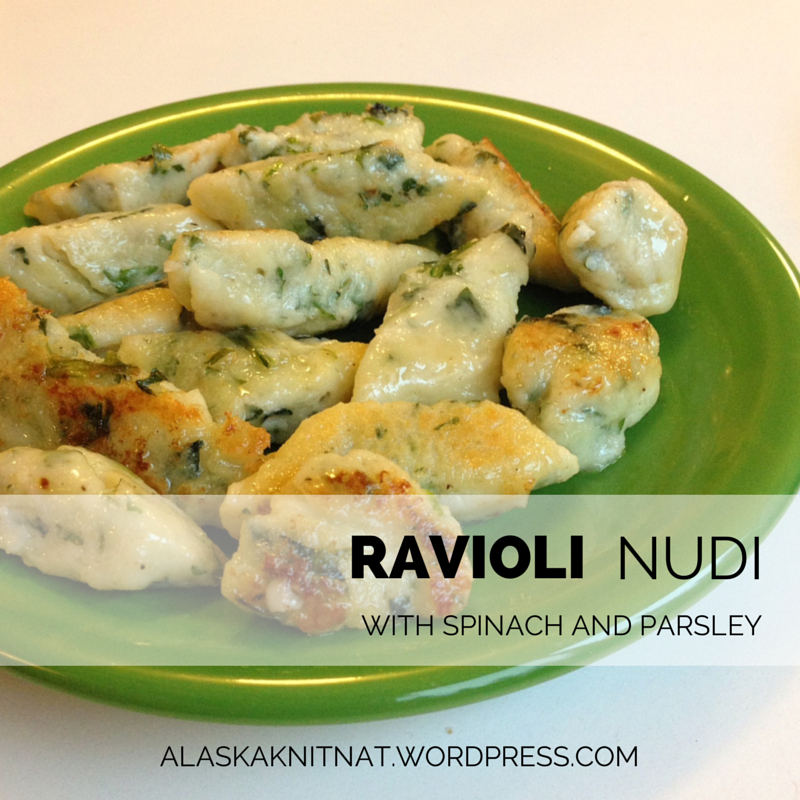 Now that you have made your ravioli nudi, there are lots of ways to serve them. 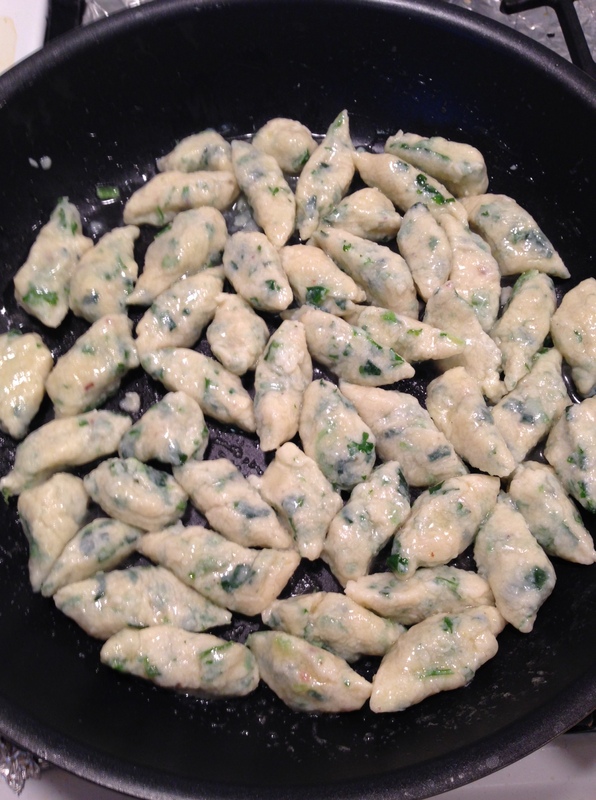 Use them in any ravioli recipe, or fry them up with butter till lightly browned and crusty. Thanks again, Chef Rob, for your excellent instruction. I’m happy to add this technique to my repertoire. I am trying to pare down our cabinets and fridge contents. This takes a little creativity. Last night I made a list of all the cookable staples such as rice, beans, rotisserie chicken, can of tomatoes, lasagna noodles, cheese and so on. I recall my friend Kelly telling me last week that she was making enchilada stuffed shells. 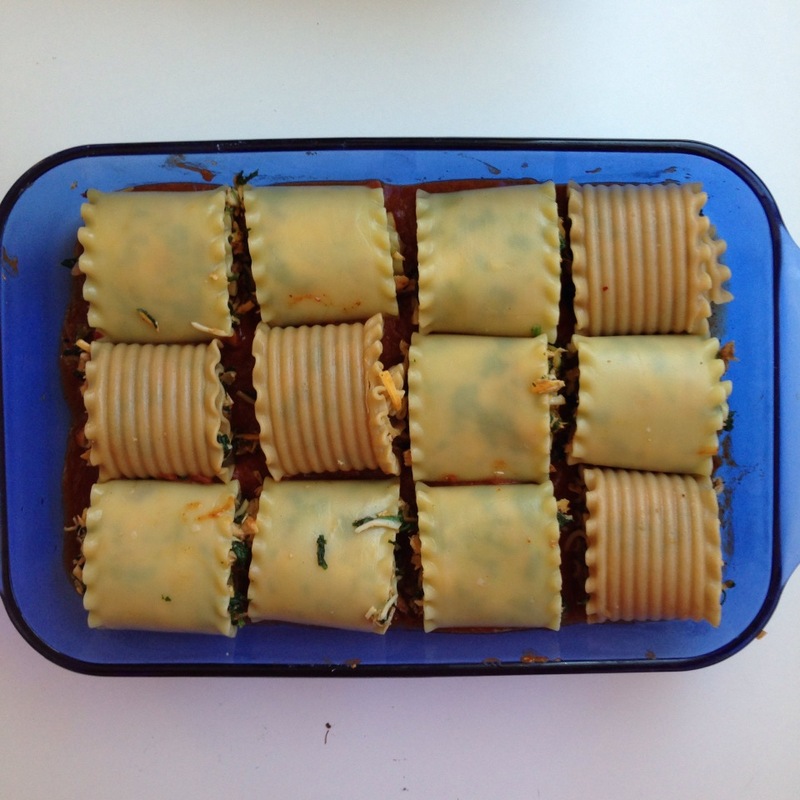 Any time a recipe calls for stuffed shells I automatically switch to lasagna roll-ups. You don’t have to be as ginger with them and they are really easy to serve. 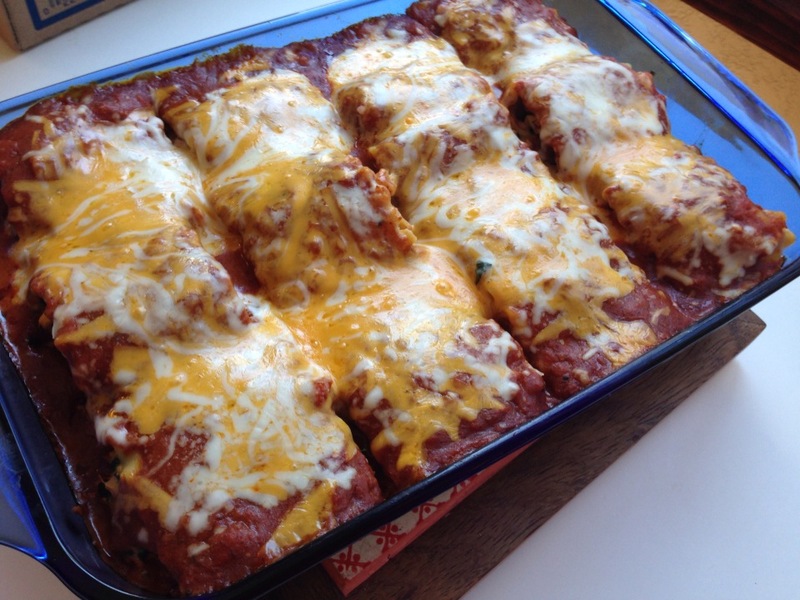 Why not make enchilada roll-ups with lasagna noodles, leftover chicken, spinach, cheese and homemade enchilada sauce? Sounds good to me. It was! Since I only had a can of tomatoes, I decided to make my own enchilada sauce using this fabulous recipe from DamnDelicious.net. I will never buy enchilada sauce again if I can help it. It was thick and bursting with flavor. As for the roll-ups, I modeled my recipe from this one at Bevcooks.com. I tweaked it here and there, but I think this experiment may become a staple in our household. I was licking the plate! Preheat oven to 375 degrees. 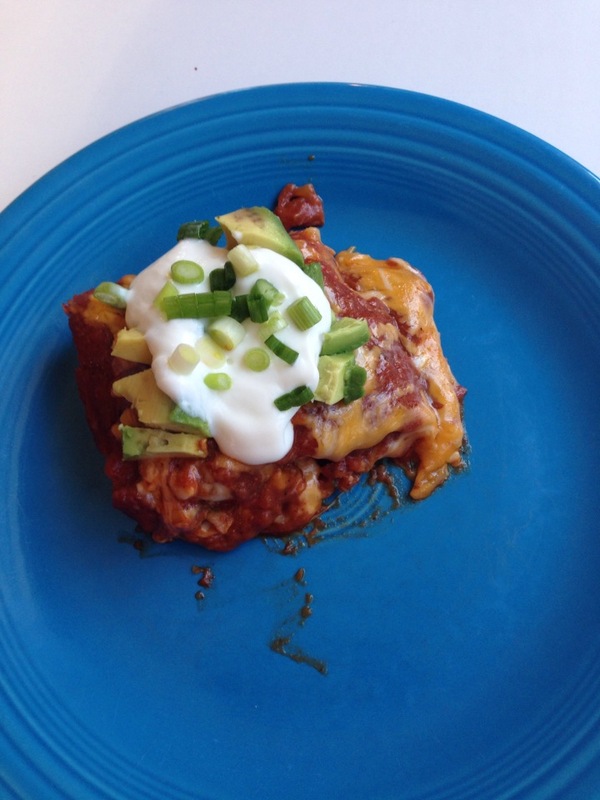 Coat the bottom of a casserole dish with a generous amount of enchilada sauce. While the lasagna noodles cook, combine the spinach, chicken bits, chiles, egg, salt and pepper and 1/2 cup of cheese. Mix it well. 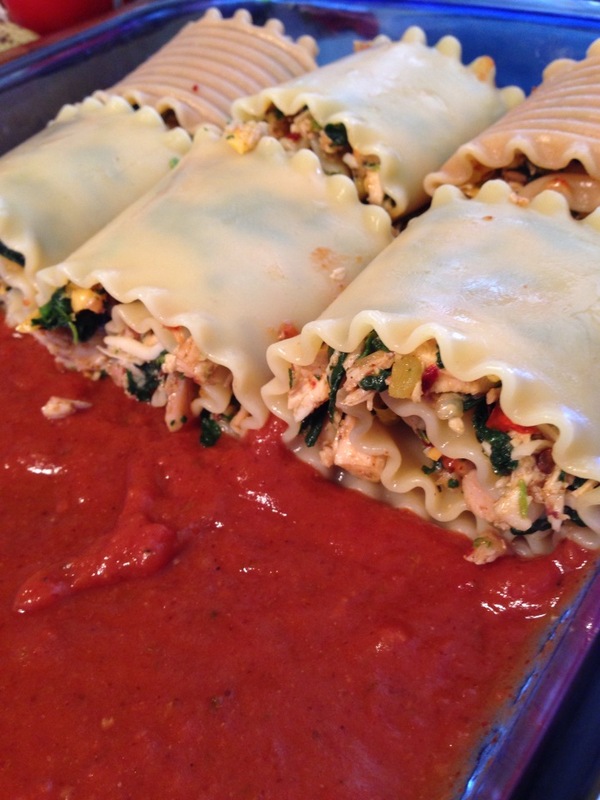 Spread a couple of tablespoons of the mix into each lasagna noodle. Roll up the noodle and place it seam down in the casserole. Repeat with rest of the noodles and filling. Top with remaining sauce and sprinkle liberally with grated cheese. Cover and bake for 30 minutes. Remove foil and bake another 10 minutes, if desired. Let sit 5 minutes before serving with chopped scallions, sour cream and avocado.